Ridler’s gallantry – essentially survival with dignity – had earned him decorations and promotion by the end of the war; but neither of these would augment the back pay and pension that he had been demobilised with to ensure him a reasonable standard of living. Before the war, he had lived well until his father’s inheritance had come to an end. The life of a young gentleman had been an expensive one: houses, horses, tailors and travel had all drained his money away. With no further expectations, he was forced to accept the security of a commission as a second lieutenant to avoid humiliation and the pack of pursuing creditors. The same mistakes again would be the end of him. He had been determined to find a way to live where he would be master of his own destiny. Never again would he put his trust in arrogant fools like Townshend. He could not work for those whose privilege, power and incompetence were bare for all to see. He would set out alone. After handing in his army greatcoat and form Z50 at East Grinstead railway station, he had received another pound to supplement his meagre resources. And then he had bought a poultry farm. 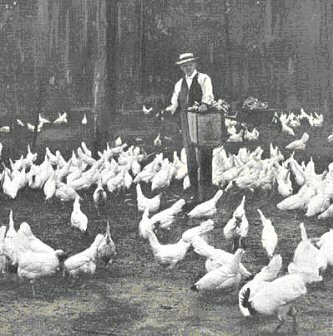 Sergeant Terence ‘Shorty’ Short, a fellow traveller who had come through the march to Anatolia with Ridler, had a pair of elderly parents who needed to sell Postern Poultry Farm. Failing to be alerted by Shorty’s unwillingness to take it on himself, Ridler bought it for a song. But he had known nothing of keeping chickens and his heady optimism eventually turned to bitter failure. His fundamental error had been to try to fatten up layers to sell as birds for the table. The quality of their lays deteriorated in the process ,and his bread and butter income from delivering eggs to pubs and restaurants in the River Wandle valley foundered. And this sacrifice did not pay the dividend he had hoped for: never able to afford quite enough feed for the purpose, the fattened birds were little more than adequate at best, scrawny at worst. The long decline was arrested by an outbreak of avian tuberculosis and, after two miserable years, Ridler slaughtered the remaining birds, levelled the chicken sheds and left the land for his creditors to fight over. And then he had done what any level-headed, ex-serviceman, chicken farmer would have done: Ridler ran away to join the circus.